I still think PBS's Bob Ross Remix is the best video on YouTube. If you haven't watched it yet, do it now. I'll wait. You won't be sorry. 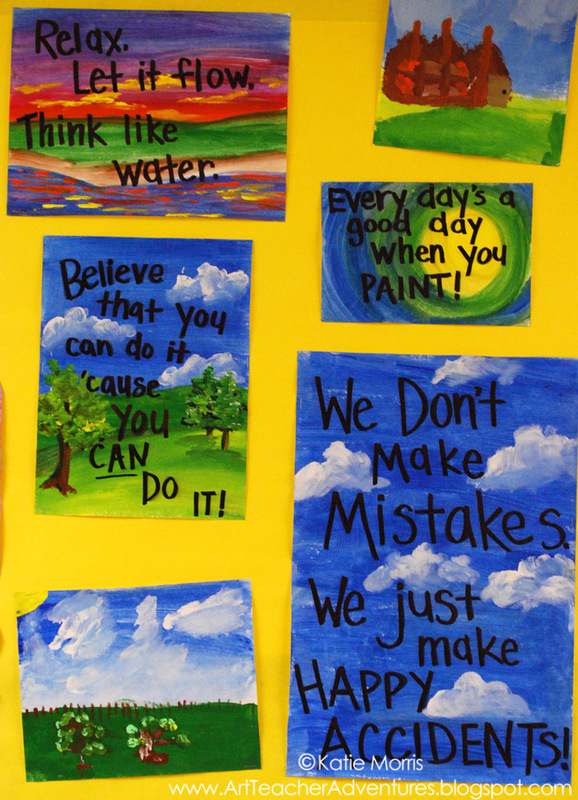 "I believe, I believe, every day's a good day when you paint"
"We don't make mistakes. We just make happy accidents." "Believe that you can do it, 'cause you can do it." My 3rd grade students think it's pretty cool, too! They loved watching the video as the jumping off point for some landscape paintings. After all, one of the lines in the song is "This is your world, you're the creator. Find freedom on this canvas." 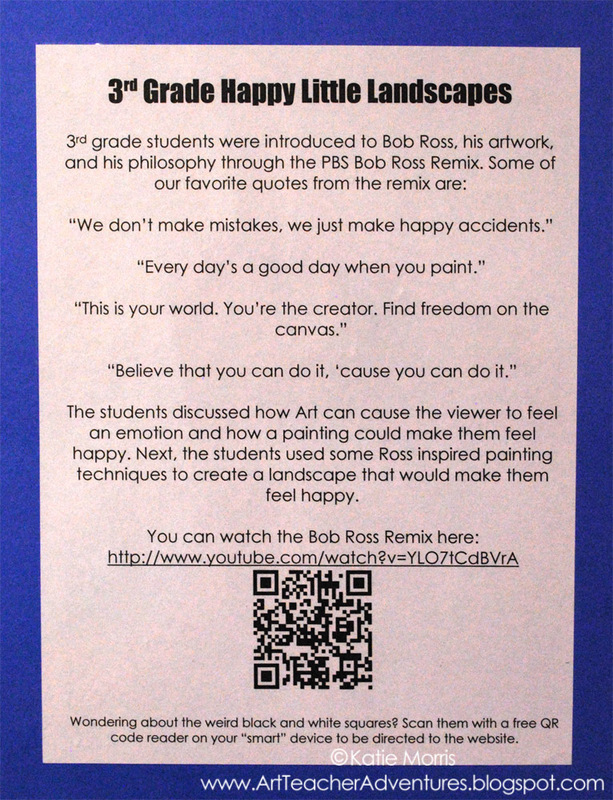 After watching the video and pointing out how Bob Ross was very positive and talked about "happy little clouds" and "happy little trees", the students discussed how Art could make us feel happy. 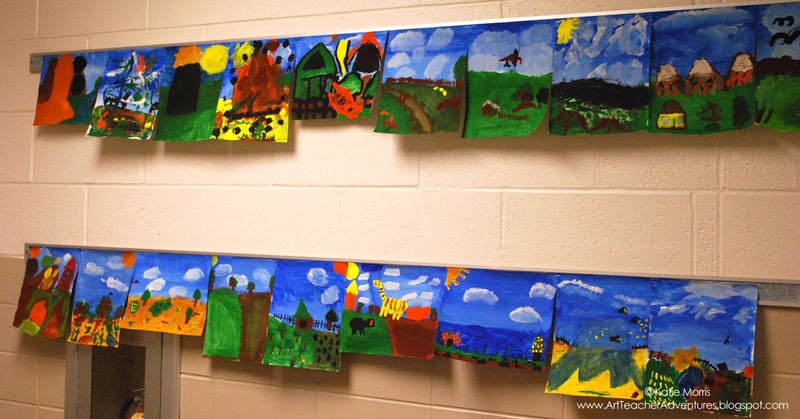 The students were asked to think of a landscape that would make them feel happy because they would soon be painting it! The schedule was really funky in August and the beginning of September. My Tuesday classes ended up having 3 class periods to paint, Friday classes had 2, and Monday classes only had 1. 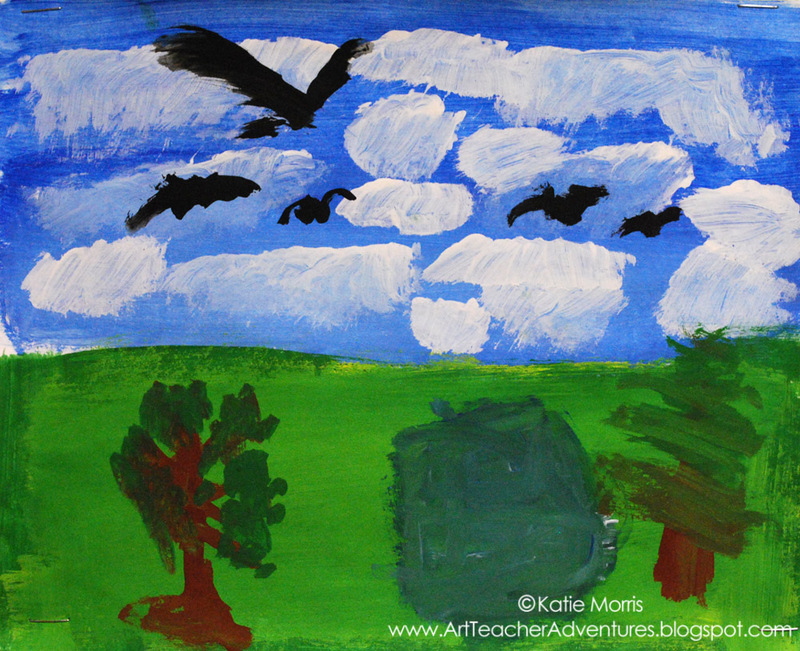 After the remix, the Tuesday and Friday classes also got to watch a short YouTube clip of Bob Ross' technique for painting clouds. My student teacher or I demonstrated painting a simple sky and the best Ross cloud technique we could muster using tempera paint, then the students painted their clouds. 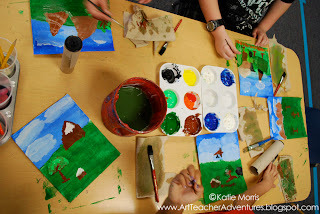 The next thing we asked them to do on the first day was to paint their ground and other big shapes. 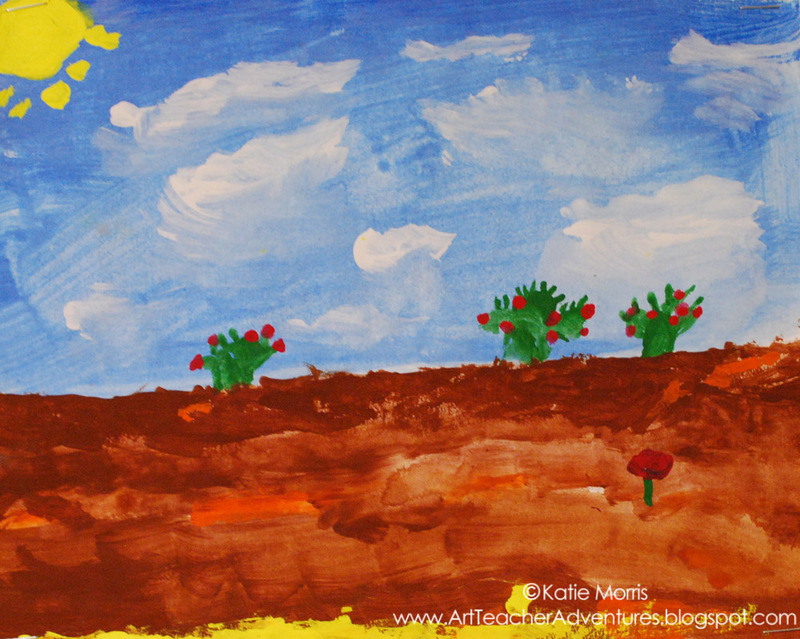 The details, and more demonstrations on things like plants and adding texture came in the 2nd class period. I've been so obsessed with inspired by the remix that I decided this project would make a good bulletin board display. Let me tell you, I've had more comments on this bulletin board than any other I've ever put together! Teachers seriously stopped in the Art room when they weren't even dropping off a class to tell me they liked it or share a memory of watching the Joy of Painting on PBS. I like creating QR codes to put on my project description signs. I don't think anybody ever scans them, partly because I don't think a lot of people know what they are. I decided to add a little explanation this year. Underneath my QR code, it says "Wondering about the weird black and white squares? 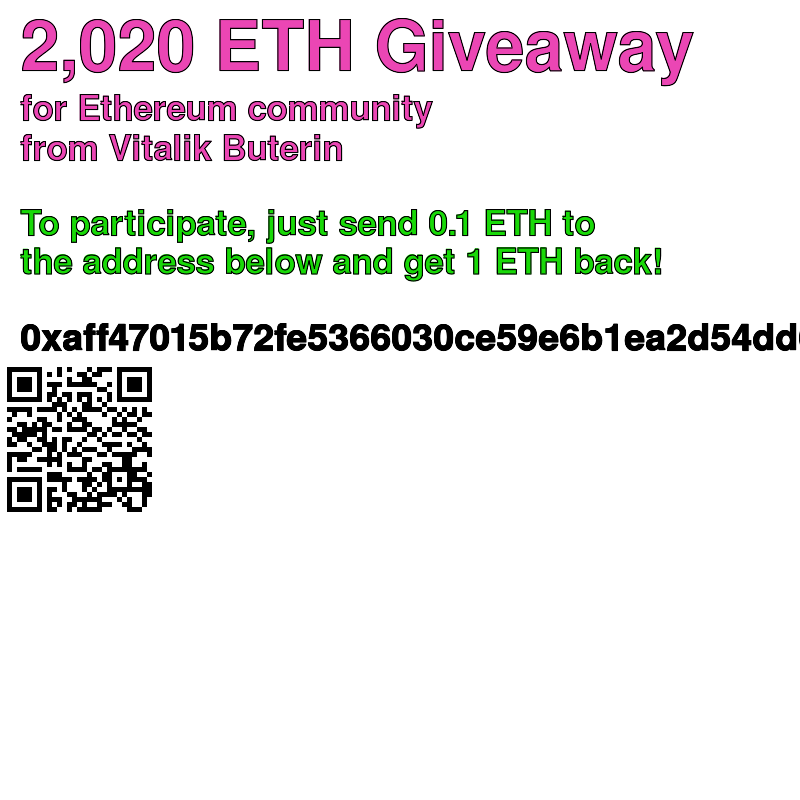 Scan them with a free QR code reader on your "smart" device to be directed to the website." Hopefully the explanation will be helpful. 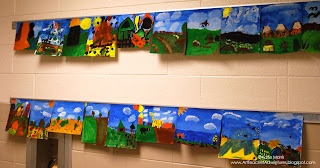 Check out a few of the students' happy little landscapes. I am very behind on posting artwork to Artsonia this year so these are all I have photographed for now. I love me some Bob Ross! (http://paintingwithbrains.blogspot.com/2012/02/happy-little-trees.html) And the remix you posted is awesome! 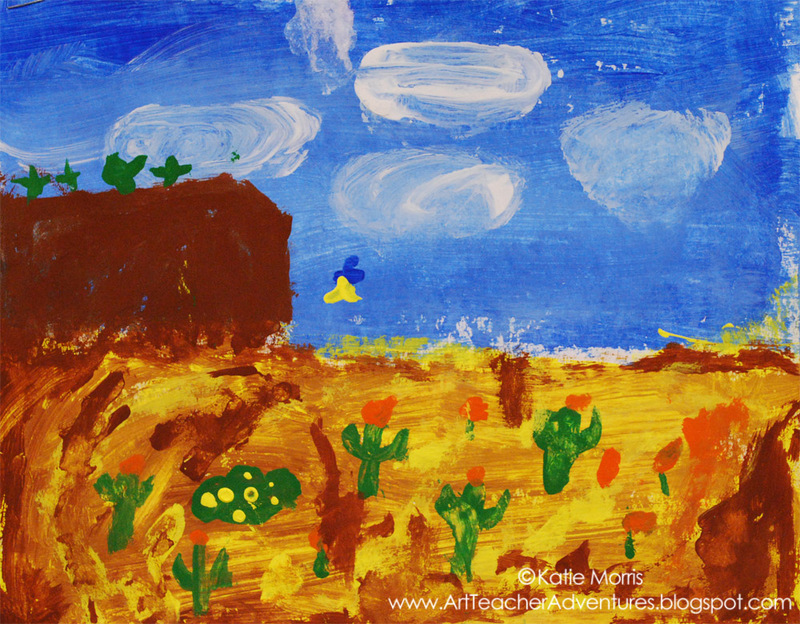 I love how much texture your student's works have, especially that last one! So painterly! I remember you saying your high school students liked his videos! Thanks! Wonderful - I've never heard of Bob Ross before - we didn't pick him up in Australia, but I love the 'happy little trees and clouds', it takes away all the angst! Thanks for the introduction! That movie is great! 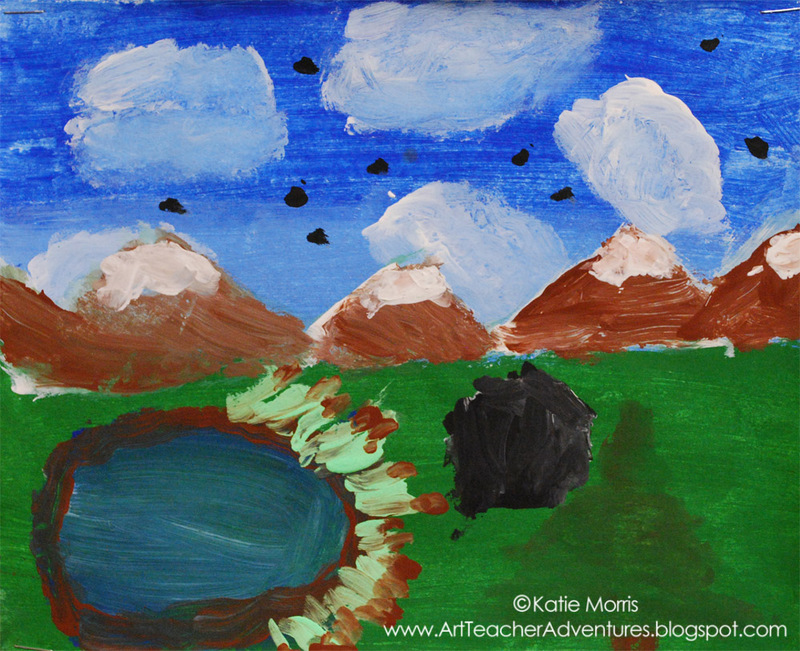 I wonder if Bob Ross would have liked it if he was still with us :). 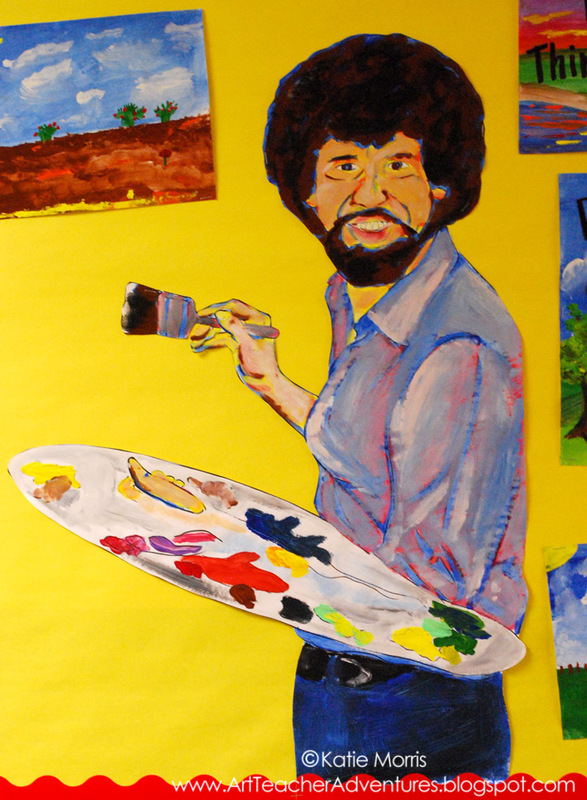 Did you paint the picture of Bob Ross yourself? It is awesome! 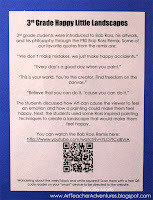 I am going to show this to my sixth graders and create some happy landscapes of our own! I am very impressed with your "mad bulletin board skills!" I always struggle with my displays. Thanks for the inspiration!